Waitangi Treaty Grounds is probably the most historic and significant site in New Zealand. Only three hours north of Auckland, it should be a required visit for anyone who wants to understand this great nation. Once you arrive, take the tour and experience the cultural show. This was my third visit to the Waitangi Treaty Grounds since we immigrated to New Zealand 13 years ago. Yet this time it was different. There is a fascinating new museum, plus I got to see it all through the eyes of our two European exchange students, but it was the walking tour of the grounds that brought the history alive. 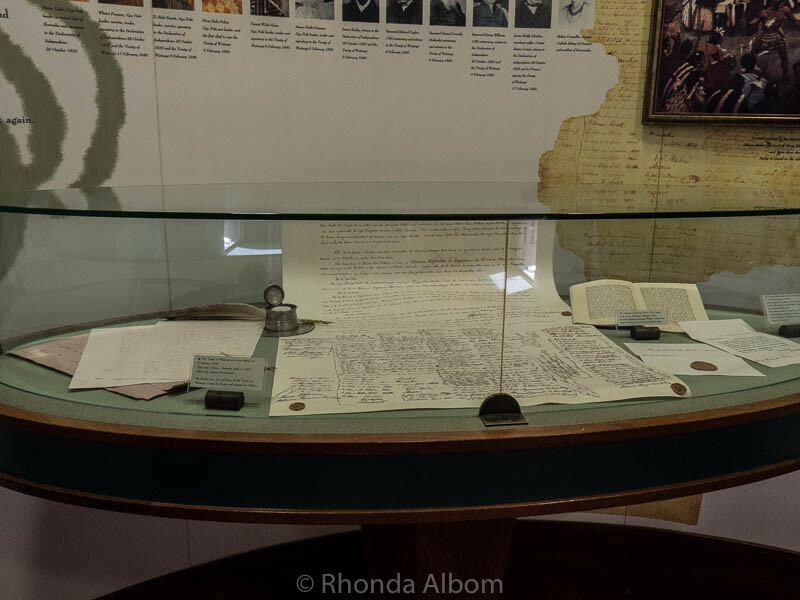 In short, the Waitangi Treaty Grounds marks the location of the signing of the document that created the New Zealand we know today. In 1840 it brought the Maori and British people together, creating a nation under one rule . . . and creating controversy that is still being resolved. The problem stems from the interpretation of a single word: sovereignty. The agreement between the Crown and the Chiefs of the United Maori tribes was in two languages, and they are not the same. The English version gave the crown sovereignty over the land. As there is no direct translation (English to Maori) of the word sovereignty, so the translator used the word governance. Thereby the chiefs believed they signed an agreement that allowed the Crown only governance in return for protection. There is much more to this issue than just this simple explanation. 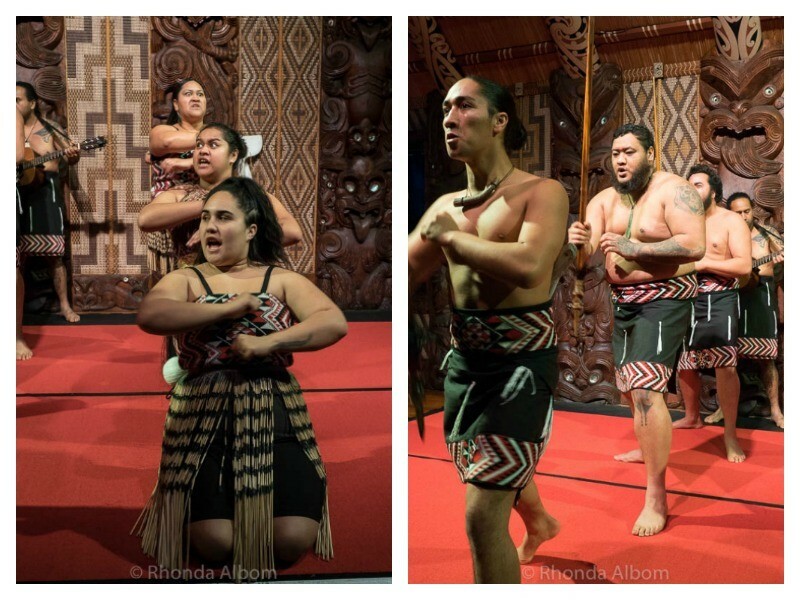 The Maori cultural performance takes place at Te Whare Rūnanga, which is a traditional meeting house. 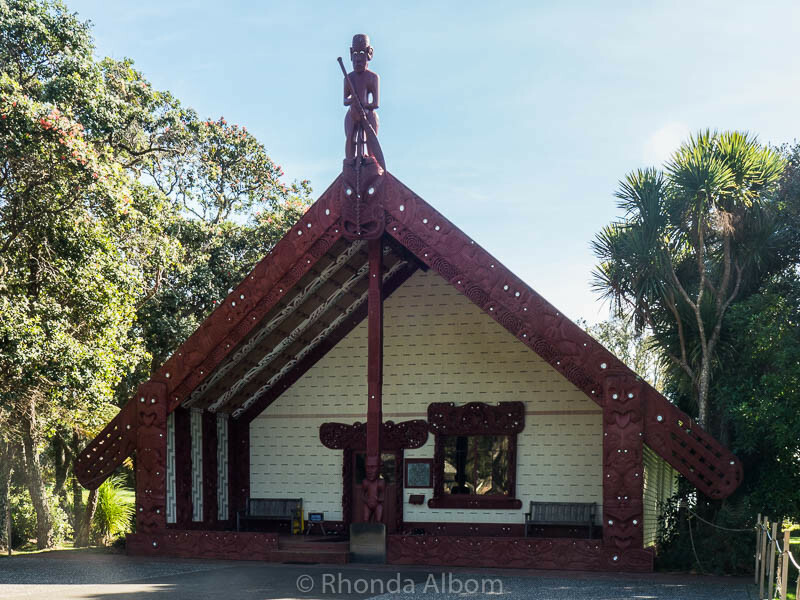 Actually, this one deviates from tradition as it faces south and the carved panels inside represent all of the Maori iwi in New Zealand, rather than just local styles that would be found around the country. 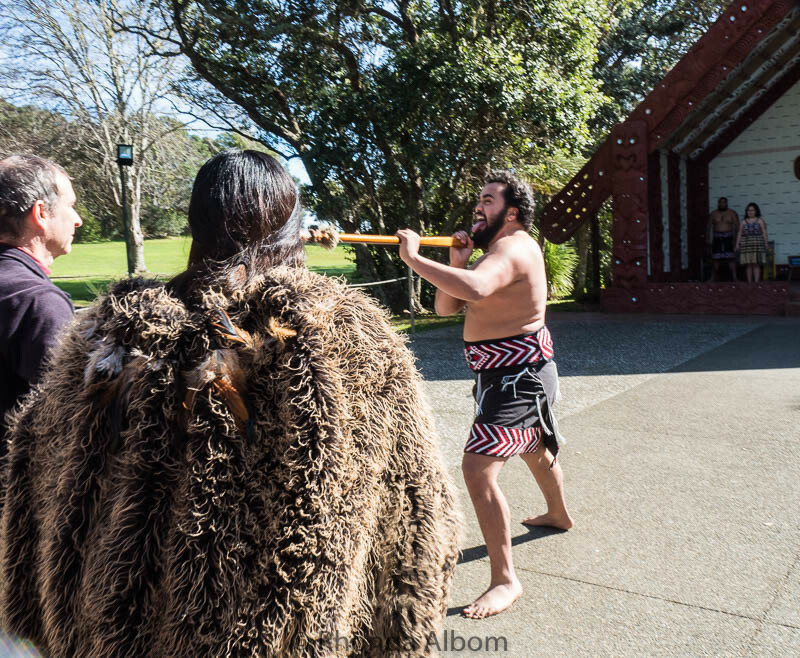 Our experience began with a pōwhiri, a traditional Maori welcoming ceremony. Our “group” of guests chose hubby to be our chief. He was to pick up the rautapu (a symbolic offering – often a small branch) to show we come in peace and then we were all welcomed inside. 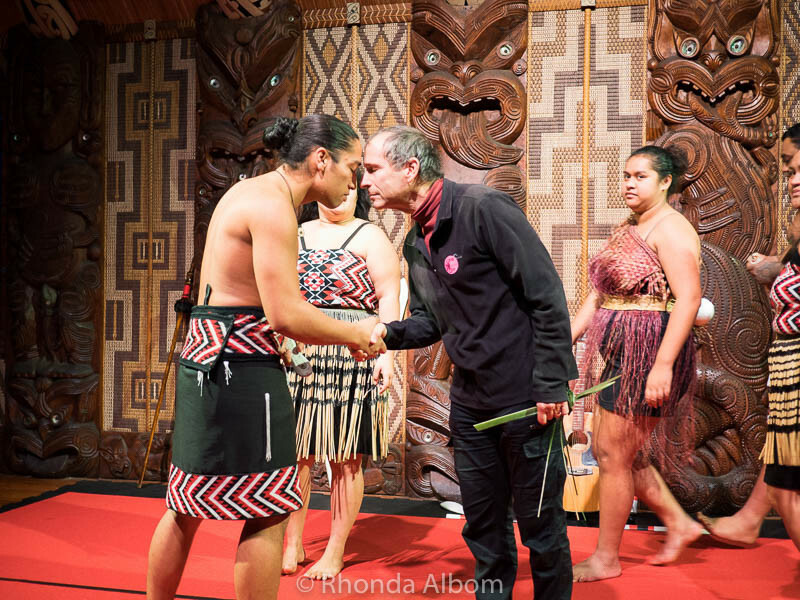 Once inside the welcoming ceremony continued with a shared breath (hongi) between the chiefs. The show consisted of dances, songs, and weaponry. More importantly, there was an easy to understand narration explaining the actions and the culture. After the show, our group was first to have our photo taken, as we are Chief and “Mrs Chief” (plus two AFS exchange students). This home of James Busby, the “British Resident” appointed by the Crown in New Zealand is located near the meeting house. He, along with James Stuart Freeman and William Hobson co-authored the treaty, which was then translated to Maori. Busby’s house had been taken apart and brought in to New Zealand. 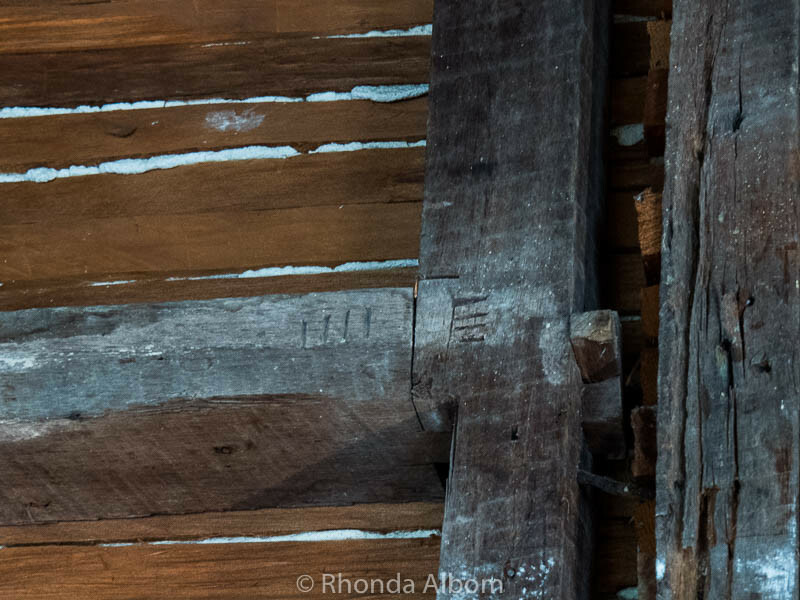 Hash markings carved into the joints told the workers how to put it back together. A copy of the treaty made in the late 1800s before it began to age. 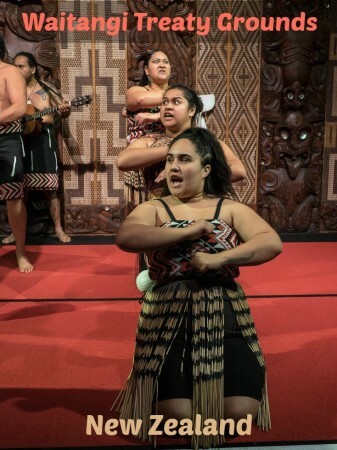 The originals, both English and Maori, are safely stored in Archives New Zealand in Wellington. 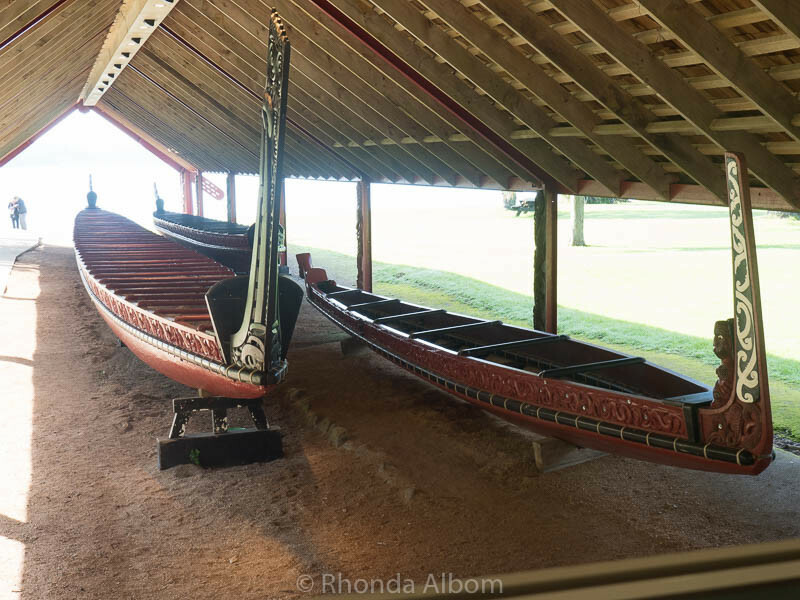 These waka taua are decorated war canoes. The flagstaff flies three flags: New Zealand’s original flag (The United Tribes Flag), the flag of St. George, and the current flag. It marks the spot where the treaty was signed in 1840. Interestingly, the original flag had been first created as Busby needed a trading flag so as not to be thought of as a pirate. The view from the Waitangi Treaty Grounds looking out towards Russell, New Zealand’s first capital city. 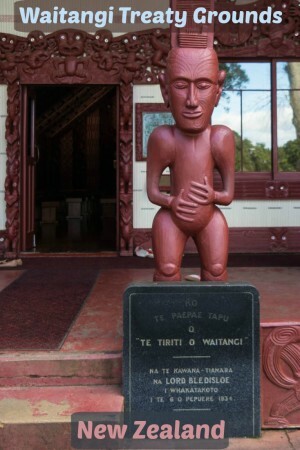 The Waitangi Treaty Grounds are located in the Bay of Islands, 2 kilometres north of Paihia. There is plenty of free parking. The grounds and museum are open every day from 9 am to 5 pm, with extended hours in summer. Day entry includes a guided tour, cultural performance, film, and museum and ground entry. The tours and performance are timed, and bookings can be made in advance. I recommend allocating 2-3 hours and seeing it all. If time is limited, don’t miss the tour or cultural performance. 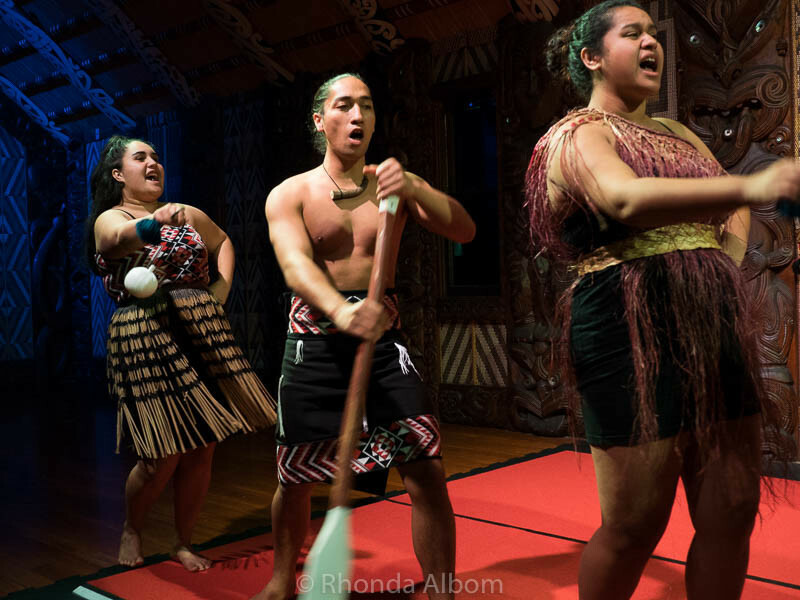 A hangi and concert option is available on Tuesday, Thursday, and Sunday summer evenings. More information is available on its official website. 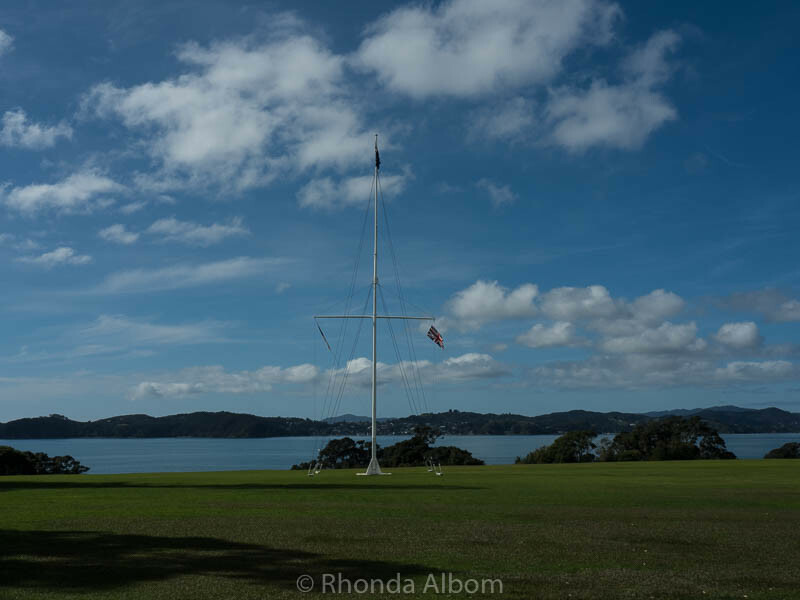 If you are heading up north in New Zealand, the Waitangi Treaty Grounds in the Bay of Islands are one of many fascinating things to see. 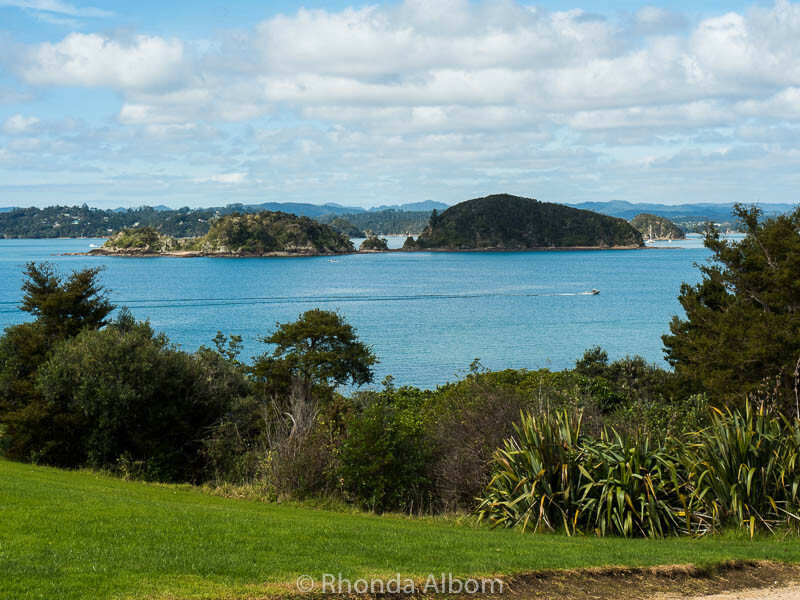 We visited as part of our recommended Northland itinerary for a 4-5 day adventure. 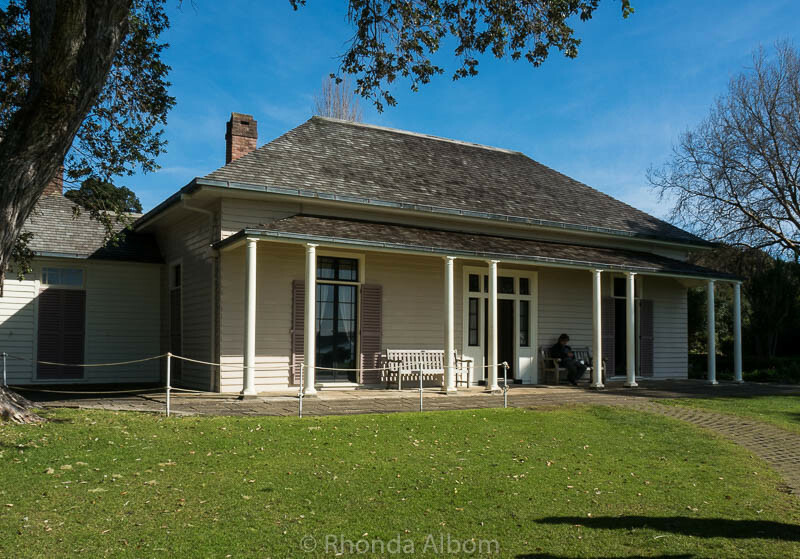 Have you been to the Waitangi Treaty Grounds? Disclaimer: We were provided with complementary entry. However, the opinions expressed here are strictly my own. I honestly know very little about the history of New Zealand so it was so nice to get to learn a little bit! You don’t see any kiwi history in U.S. school books unfortunately. I grew up in America, I know. I would definitely want to experience this. It seems synonymous with New Zealand, and an amazing way to learn about the culture and history. Seriously, I need to go to NZ. Yes, you seriously do need to visit, and hopefully when we are here. I would recommend allocating a bit of extra time if you are a reader in museums. There is so much to see. The dancers look so engrossed in their performance, it would be a pleasure to watch them and listen to the narrative. It is, fascinating, beautiful, and informative. If i’m ever blessed enough to get to New Zealand (which i really want to do), this will be at the top of my list of places to go. I do hope you get here, and the treaty grounds are a great choice for a visit. 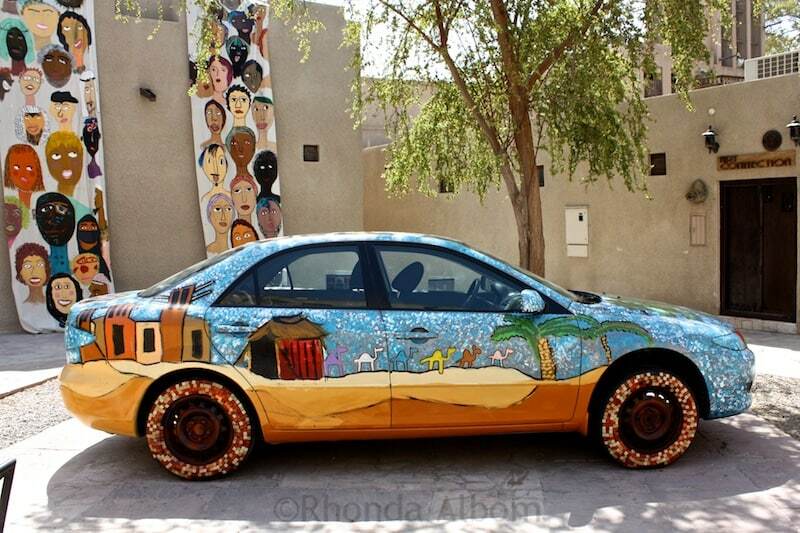 Very interesting Rhonda! Even in one language, one thing means something in one country and another in another country. I know that is true in Spanish. So, I can see how difficult it can be to reach a complete understanding when people speak different languages. I am reading more about the issue in the link you provided. I have lived here in New Zealand for 13 years and never really understood many of the things that go on politically. Just a few hours at the treaty grounds and I feel like I finally understand the issues. As an Australian, it’s a little difficult to confess that I’ve not been to New Zealand. It’s always been so close, and I have chosen the faraway places. But I promise myself that I will explore our close neighbour. This looks like a place that should top the list of not to miss places. As we are planning our next travels we were just talking about this exact topic and adding Western Australia to our options mix. Waitangi Treaty Grounds seems definitely like one of those living history museum everybody should see. I’m sure those two European students enjoyed it a lot. Yes, the girls loved it, and there was plenty of other things to do nearby that they also enjoyed, so it was a great weekend. LOL – the longer you look, the longer your list. New Zealand is awesome. The treaty grounds are really special. this looks like a really worthwhile destination. It’s interesting to see where NZ, Australia, Canada and the US are alike and different in their treatment and mistreatment of the original native people in their countries. it’s the darker side of colonization for sure. I completely agree. There are quite a few similarities, and many more differences. I love the shared breath photo – what a unique concept I’ve not seen elsewhere! 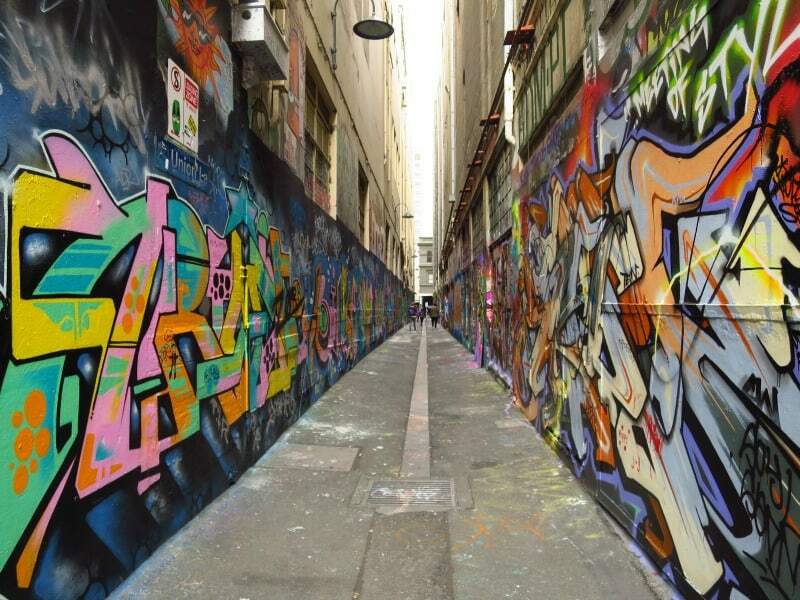 Great photos – looks like quite an interesting place to visit. 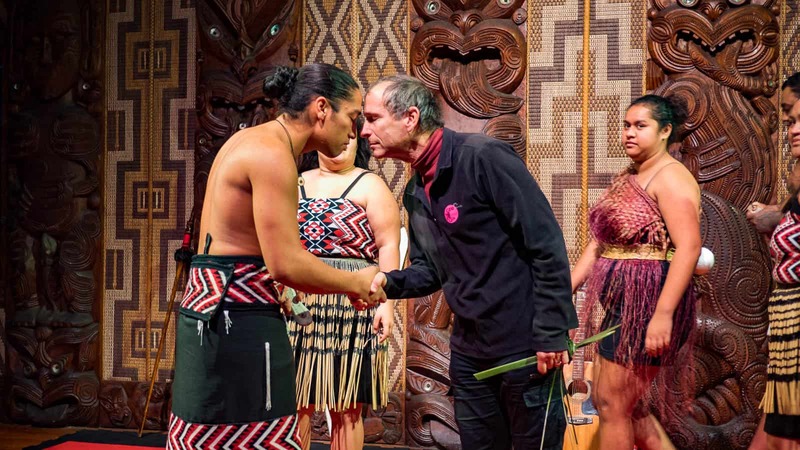 The shared breath is part of a traditional Maori greeting. The treaty grounds should definitely be on your list. When are you headed here? As for AFS, our Sarah is in Argentina for a year with AFS, and we have an Italian girl here with us now. I am the support person for the other girl, but they get on great so we brought them both with us. Thanks for the explanation about the treaty. One of my friends visited and found the rules about dealing with the Maori people confusing. I also have a CP who lives in NZ. She writes YA Contemporary fiction, and I suggested she write something with Maori characters in it. Western people like learning about different cultures. But she said she was afraid to because there can be backlash from the Maori community. I’m glad the exchange students enjoyed the visit. The guided tour was so filled with interesting information. I can understand your friends worry, however all she needs to do is ask. I went through quite a few layers of people to get permission to post a specific photo (of mine) that I had taken, but once I found the right person to speak, they were incredibly helpful. Maybe she could find a Maori advisor. There is so much to see and do in New Zealand. I am glad Waitangi made it on to your list. 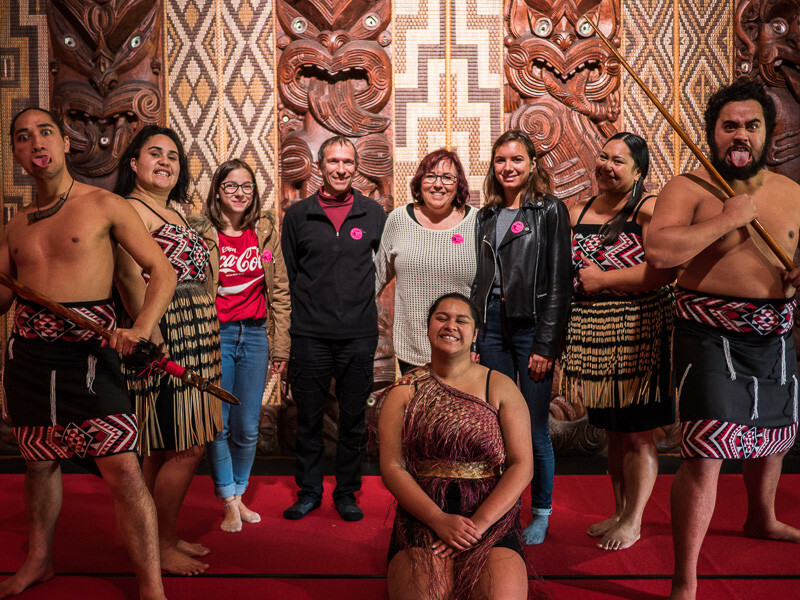 I’d have to agree – Waitangi is a must see destination for folks. We thoroughly enjoyed our time there and learned heaps about NZ history. The new museum is really good, and worth another visit when you get back to NZ. I would love to visit there. Treaties are often not worth the paper they are written o n. Ask the American Indians. Just saying. The parallels between the two counties are quite similar. Those poor chiefs had no idea. What a beautiful and educational place to visit. I love the boats. Very true, but at least New Zealand is working or resolving some of the issues. I hope things were eventually ironed out after the treaty was signed. Funny how one word can make all the difference. The differences in treaty wording is a source of contention and hearings that are still going on today. This sounds like a great place to visit. I would like to go back to NZ! If you do make it back to New Zealand, please do visit the treaty grounds. It’s very interesting. Waitangi Treaty grounds is definitely worth visiting again with their new program and museum. I know little of NZ history, but currently reading Barkskins and interestingly they go there in the 1800’s….so this post is timely for me. New Zealand history is interesting and bit of a departure from Britain’s earlier colonizations. That shot with hubby head to head breathing with the other chief is a classic. I travel around WI for food, music and outdoor photo ops. I guess I don’t go too far anymore but who knows. I envy your travels and thank you for your photos. Thanks Jeanna. I was pleased he was our Chief so I could get that shot. As for travel, Bay of Islands is only 3-4 hours from home. Not too bad.